2018 (Till infinity) promises to be a very special year for the legendary and influential Hieroglyphics imprint. Not only does 2018 mark the 25th anniversaries for Souls Of Mischief’s debut 93 Till Infinity and Del’s No Need For Alarm, but also the collective’s collaborative efforts, 1998’s 3rd Eye Vision and 2003’ Full Circle. 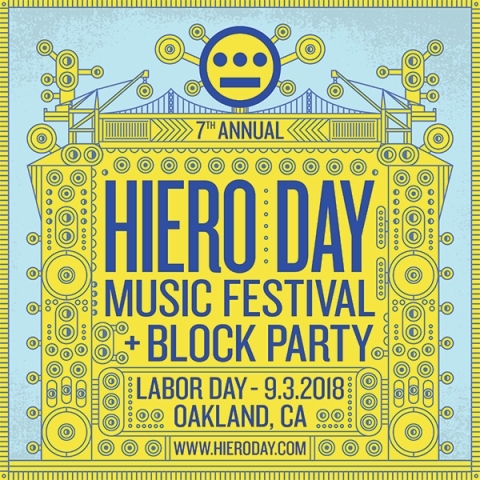 Hiero is proud to announce their 7th Annual Hiero Day Festival & Black Party which will take place on Labor Day, Monday 9-3-2018 in Oakland, CA. Hiero Day is an all-day, all-age music festival, showcasing over 40 live performances on 3 different stages by both local and renowned artists in genres such as hip-hop, rap, R&B, and more with the legendary hip-hop collective Hieroglyphics headlining the festival; and additional performances from Black Thought, Freddie Gibbs, Talib Kweli, Mannie Fresh, Elzhi, The Pharcyde, Charli 2NA, Georgia Anne Muldrow, Richie Rich, People Under The Stairs among many. The event will be hosted by Mistah FAB, Chuy Gomez, Dnas & Chinaka Hodge & Chris Riggins. After the success of the Hiero Day’s first festival in 2012, former Oakland Mayor Jean Quan declared September 3rd as “Hiero Day” in the City of Oakland. With Hiero Day in its 7th year in production, 2018 marks the biggest and best Hiero Day yet! $19.93 per ticket for an all-day (with Fast Pass & VIP Tickets also available), three stage event with hundreds of vendors and over 40 musical acts is the greatest festival bargain for any summer festival. Visit www.hieroday.com for ticketing information, as well as updates on performances, vendor information, festival activities and sponsorship and volunteer opportunities. Location, ticket and vendor info for the 7th Annual Hiero Day Festival is available here.